However, if you’re like me and you love sleep but dread waking up early, continue reading. Often times, I look at my class schedule and ask myself, WHY?? Why in the world would you decide to pick a class that begins before the sun is even up? Well, sometimes we don’t have a choice. This is my fourth semester at ISU and I’ve never had an 8am class until now. 3 to be exact. If you have classes earlier than 8am, I’m giving you a virtual hug right now. I think the best way to look at these early classes is with light (get it? Because of the sun?- I tried..). If you really think about it, you’ve probably gotten up earlier when you were in high school. The only difference now is that mom isn’t here to wake you up if you sleep past all those alarms. PLAN AHEAD – Be prepared for the next day. Pack everything in your backpack so you can save time from having to pack in the morning. Know what bus you’re going to be taking. Pick out your clothes. Anything that will save you time in the morning (so you can sleep in some more). SET THOSE ALARMS – Yes, alarms is plural. 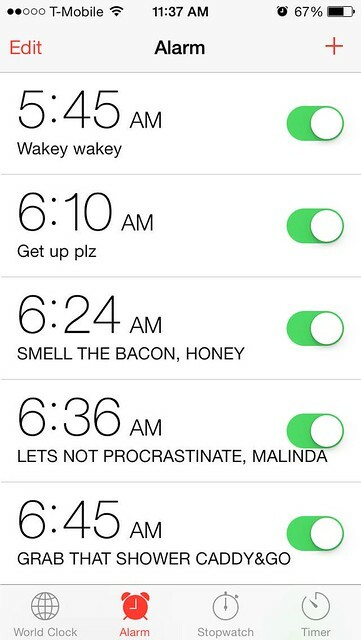 If you are the type of person that wakes up by the first ring, I applaud you. I have 5. Ask my roommate. GET YOUR SNOOZE ON! – Don’t stay up too late and try to get enough sleep so you feel ready to take on the world tomorrow. Turn off whatever video game you’re playing and crawl into bed. Don’t even think about going on Netflix because I think you and I both know that “just one more episode” really means, “let’s finish the whole series” . BUT DON’T HIT SNOOZE! – I think we are all guilty here, but try your best to NOT hit that snooze button. I know it’s tempting but RESIST. BREAKFAST – Whether it’s a cup of coffee, a bowl of oatmeal, or a granola bar, make sure you have something for breakfast! It’s a great way to start the day and you won’t have to worry about your stomach growling while you’re in class. Yup those are my alarms..